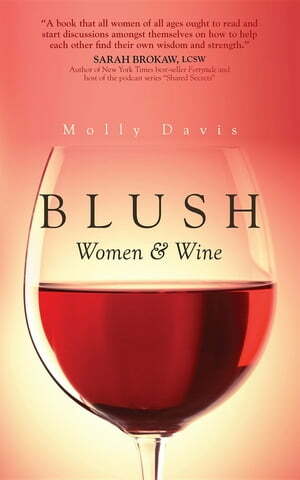 Collins Booksellers - Blush by Molly Davis, 9781942545842. Buy this book online. Whether meeting up for happy hour after a long day of work, catching up with a friend, unwinding after another day of parenting, sipping a glass while stealing time for a long, quiet soak in the tub, or commiserating over lost love, lost parents, lost jobs, lost years or lost waistlines, our wine feels like a sacred ritual that a lot of us can relate to. “We should get together for wine sometime soon." is so familiar that it is just part of our common vocabulary. What could be better than shared wine with good friends? Sometimes nothing! This is a book about women and wine. It is not a book about alcoholism, and it is not a book about never drinking wine again. It is about awareness, not intervention, and is a thoughtful, reflective and whole-hearted invitation to explore our own relationships with wine. Talking about wine is trendy. Talking about drinking too much of it is not. In this honest, vulnerable and insightful book, Molly Davis suggests that wine, for her and perhaps for many women, has become a daily habit and coping mechanism, quietly wrapped in a lovely ritual. She wonders, when do we choose to drink wine to dull pain, avoid discomfort, cope with stress, and check out of reality? With courage, wisdom and wit, she generously shares her own answers to those questions, and invites us to join her in discovering our own. Rather than hide behind our wine, Molly Davis boldly encourages us to step fully into our own lives and bring to ourselves, and to a waiting world, all that we have to offer. Now that seems like a possibility worth toasting!